I am a little introverted, shy, and easily get trapped in lack of confidence and fear. This part of the psalm is so meaningful to me because it talks about not being easily shaken – standing fast and being confident. However, it is not just a ‘believe in yourself’ kind of solution to fear. Personally, I find I have trouble anyways with ‘believing in myself’, because, fallible and flawed human that I am, I find that I usually let myself down. But this passage clearly spells out the key to not being shaken: setting the Lord always before you and staying right beside Him. This idea also resonates with Isaiah 26:3: “You keep him in perfect peace whose mind is stayed on You, because he trusts in You,” (ESV). The thing that calms our fears and helps us to step forward in confidence is not believing in ourselves, but believing in God and keeping our minds oriented around Him as we go forward in life. “My heart is glad” – Orienting our lives around God satisfies our very souls and fills us with a true joy that is not fleeting. But I also like the “live in hope” phrase. ‘Live’ and ‘hope’ are such powerful words. What would this world be without them? They make me think of the amaze-ing gift of eternal life we have in Christ, and remind me to hope in Him. “Because You will not abandon me to the grave, nor will You let Your Holy One see decay” – The first part of this phrase piggybacks off of the ‘live in hope’ idea: eternal life in Christ. God, in His astounding love, though He had every right and reason to abandon us to eternal death in Hell, has not done so. He has rescued us to life, life in Him and with Him forever. But that bit also is part of the next part, “nor will You let Your Holy One see decay,” which is a prophecy of Jesus. This is actually what Peter was talking about when he quoted the verse. God did not abandon His Son to the grave either, but raised Him from the dead and seated Him at His right hand in the heavenly places. This last portion of the Psalm is so beautiful. God is the One Who shows us the path of life. Outside of Him, we cannot know it; we cannot live an existence worth calling ‘life’. And in His presence is the ‘fullness of joy’ (as it is translated in KJV). 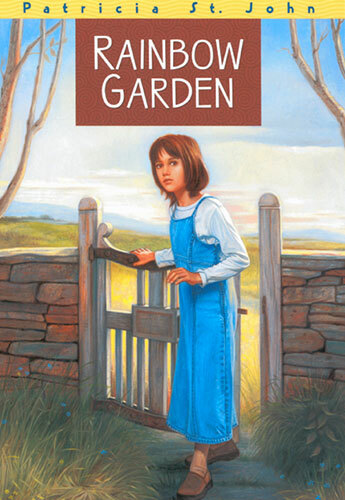 I don’t know if any of you have read Patricia St. John’s The Rainbow Garden (it is a great book!) , but if you have, you will recognize this verse, the main character’s special passage. The lonely little girl in the book hears the verse read aloud, catches only the ‘fullness of joy’ bit, and wants to find this ‘fullness of joy’. At first, she thinks it can only be found in Heaven, until Mr. Owen explains to her that “in [God’s] presence is fullness of joy.” Yes, this includes Heaven, but it can be right here and how when we are in Christ. This resounds with what Jesus said in John 15:11, “These things I have spoken to you, that My joy may be in you, and that your joy may be full,” (ESV). A life oriented around God will bring fullness of joy and eternal pleasures, which are not physical thrills necessarily as much as delights of the soul. And tying it together, the passage ends where it began, with our focus on God and at His right hand.